Mail just came . . .
Mitch sent me a *Love Bar. I have now died and gone to heaven. Peace be with this world, always and forever. 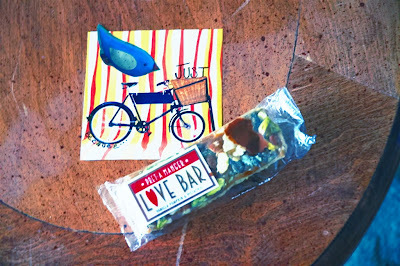 *A Love Bar is a Vanilla, Pumpkin & Pistachio granola bar sold exclusively at Pret A Manger in London. I need to give credit to Vance who introduced me to this brilliance. Props to you Mr. Vance. And now I am going back to being dead.